Penang Food is Absolutely Delicious! When you speak to any Malaysian person and ask them “Where is the best food in Malaysia?” they will tell you Penang. “Why is the Penang food so good?” I wondered. I watched the Anthony Bourdain episode on Penang and had more of a broad understanding of it and the Chinese influence on the cuisine there. As soon as I arrived to Penang, I checked into my Airbnb which I will do a write up about since it was an excellent accommodation. Penang food is interesting because it’s a mixture of Chinese and Malay cooking. Do you like beef rendang? How about trying a pork rendang! You can definitely have this in Penang. 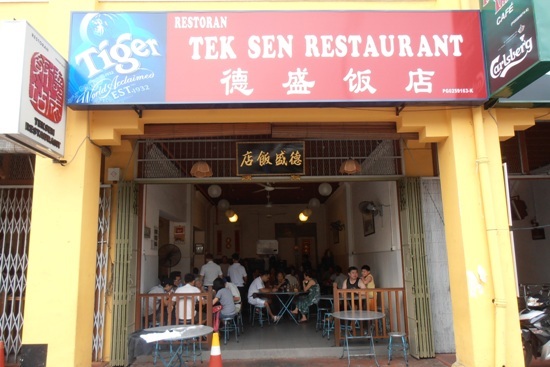 The first restaurant I visited is called Tek Sen Restaurant. This place was recommended as a good place for Penang Malaysian cuisine. I tried the fried pork that was excellent, shrimp with vegetables and fried rice. I must say the food was quite tasty and not too expensive. In the evening, I got the chance to visit a restaurant called Mama’s Nonya Cuisine which had more of the fusion Malay-Chinese cuisine I mentioned earlier. The name nonya refers to this type of fusion food. I tried the wild boar rendang, jiu hu char and lor bak (cuttlefish with turnip and carrot), and lor bak (pork roll with 5 types of spices). The dishes were quite tasty especially the wild boar rendang since I wanted to try Penang traditional cuisine. If you are looking at trying some local Penang cooking, try out this restaurant. During the next day, I enjoyed the Cooking Class and went out in the evening with a local Penang friend who was able to take me to some of the street stalls. 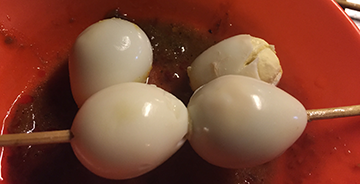 I went to a few hawker areas and tried quail eggs which you put in boiling water. He also gave me another type of meat but he wouldn’t tell me what it was. It’s probably better that way since if it’s some body part of an animal you do not normally eat you can focus on enjoying the taste. I’d have to say that my favorite dish in our hawker run was fried koay kak. When I first looked at the dish, it didn't appear to be that appealing. I was very wrong since it was the best dish I had all night. 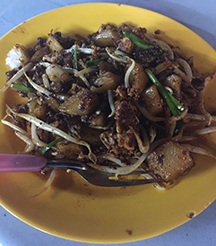 The dish is called fried rice cake and many of the local hawkers have it. I highly recommend trying it and tell me what you think on here. On my last day, I got the opportunity to visit an Indian Muslim restaurant named Kapitan. My friend told me that it had the best tandoori chicken in Penang and I told him “I’ve had tandoori chicken in many of the cities I’ve been to.” His response was “Try Kapitan.” So that’s how it went and off I was to the restaurant. I put in my order and within a few minutes the tandoori chicken and plain naan bread was on my table. Let’s just say this was the best tandoori chicken I’ve ever tasted. Usually when I try the dish the chicken comes out plain dry. This one was as juicy and flavorful as ever. I pretty much ate all of the chicken and wanted to call my friend right then and there to thank him for the recommendation. I later did and that’s when he told me “Kapitan was around when I visited in 99.” That just goes to show how good the place is! Afterwards, I got my stuff ready to board a flight to Kuching but I knew that I would have to visit again. The Penang food was just incredible!